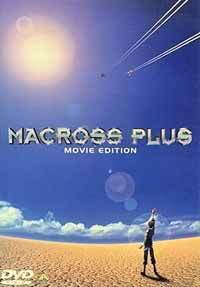 Notes: Edited version of the Macross Plus OAV series, with added footage. Isamu Dyson, a hot-shot Valkyrie pilot, finally got the job of his dreams -- being the test pilot for a highly experimental aircraft to compete against another company's design. The first day of his job on planet Eden, though, he finds out that the test pilot working for the opposition is none other than cool-as-ice Guld Bowman, Isamu's once-friend-now-bitter-rival. Isamu and Guld had always tried to one-up each other in everything, whether it be in flying skills, bravery ... or for the heart of Myung Fan Lone, their old classmate. Coincidentally enough, Myung is also on Eden as the manager for Sharon Apple -- the galaxy's most popular virtual pop-singer. I goggled. I gasped. I couldn't believe my eyes. All four parts of the incredible Macross Plus OAV series, condensed into one affordable movie package? And featuring all-new, never-seen-before footage, too? It seemed too good to be true. So I bought it, took it home, and watched it; and you know what? It was. It's not that it was done poorly, though. Macross Plus: The Movie is done just about as well as anyone else could do it; the main problem is that the job happens to be one that, in my own opinion, simply cannot be done. Squeezing three hours of story into two hours plus cutting scenes to make room for extra footage is tantamount to trying to stuff that extra shirt into a suitcase that's already spilling over the sides. No matter how much you pound, mash, or jam, it just won't work. Something has to go, and in the case of Macross Plus: The Movie, that something is the overall effectiveness and pathos that made the original OAV series such an evocative viewing experience. Oh, that same gorgeous art and animation is still there, no doubt about it, and the action scenes are still brilliantly rendered, minus a few scenes here and there that got axed to fit constraints. The score still consists of those dramatic orchestral swells that send shivers down the spine. But the thing is, without all those itty-bitty scenes of rumination and character development that were snipped -- a second here, a minute there, three minutes over there -- the story lacks the "punch" that keeps you glued to the screen, anxiously waiting to see the fate of Guld, Isamu, and Myung. The emotions end up feeling forced, the sentiments contrived. The "extra footage" so exuberantly touted on the box ends up being little more than plot-patchwork to close up the credibility gaps left by the cuts, and it shows like a torn-up piece of paper mended with Scotch tape. It ends up being just another mecha anime -- a technically spectacular mecha anime, but just another mecha anime nonetheless. Don't get me wrong, though. Macross Plus: The Movie is still a fine piece of animation work, but it can't possibly compare to the glory of its OAV predecessor. They say you get what you pay for, and I'm inclined to agree. If at all possible, go for the OAV series instead; the extra time (and cost) is well worth it. Recommended Audience: Somehow, they made everything more explicit in this shortened rendition. More gore, more overt sexual themes, and more violence make this something not for the kiddy crowd. Love that "extra footage." And naturally, there's also a portrayal of sexual assault, much like in the original series.